Dantooine is located in the Raioballo Sector of the galaxy, had a long history with the Old and New Republics, as well as the Alliance. Dantooine is a tranquil world whose inhabitants remain largely unaware of the isolated incidents when the planet drew any sort of galactic attention. 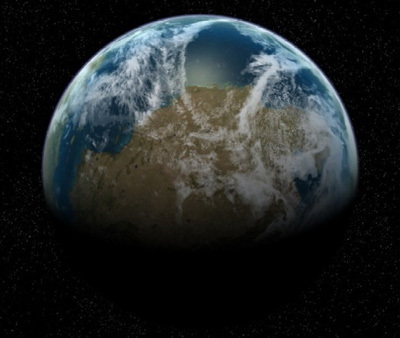 The planet is almost entirely undeveloped, an unspoiled world wrapped in clean oceans, with its exposed land covered by olive-hued steppes and open savannahs of lavender grasses. Two moons orbit Dantooine. The planet is rich with life, with the primitive hunter-gatherer Dantari -- thick-bodied humanoids who roam the coastal shores -- representing the height of technological evolution. Other life-forms on Dantooine include the balloon-like fabool creatures and stalker lizards. The average day on Dantooine lasted 25 standard hours, and its year encompassed 378 local days. Thousands of years ago in the distant past, Dantooine was open to colonization. Isolated family estates dedicated mostly to agriculture arose, but the population density of Dantooine remained extremely low. The Aratach Corporation established an outpost there over four thousand years ago, and erected a small spaceport to handle imports for local merchants. Also at this time, Jedi Master Vodo-Siosk Bass established a training center among the tranquil and mysterious ruins found on Dantooine. For generations, this praxeum trained many notable Jedi Padawans, including future Sith Lord, Exar Kun. Though it survived the Great Sith War, the praxeum was razed to the ground by Darth Malak in the decades that followed and the ruins remained abandoned for centuries. In modern times, only a few isolated ranches remain. Millennia later, Dantooine was ravaged during the Clone Wars, when the Separatists tried to take control of the planet for use as a staging area for warships protecting the planet Muunilinst. Jedi Master Mace Windu almost single-handedly defeated the Separatist forces on Dantooine, leaving the planet free. Because of its remote location and small native population, the planet once housed the Rebel Alliance's primary base. Unfortunately, the Rebels grew complacent on the tranquil world and allowed an Imperial tracking device to infiltrate the base in a cargo shipment. However, the Alliance had planned well, using pre-fabricated, self-constructing buildings to construct the base, allowing it to be torn down swiftly after it was learned that a traitor had given away its location about six months before the Battle of Yavin. When the threat was discovered, the Rebels evacuated Dantooine in a single day. When interrogated by Grand Moff Tarkin, Princess Leia Organa lied to him, disclosing the location of the then-current base as Dantooine. Its distance spared it from being made an example of the Death Star's powerful superlaser cannon. Nonetheless, Imperial scout ships reconnoitered Dantooine, only to find the long-abandoned remains of a Rebel base. Enraged at this news, Tarkin ordered Organa to be terminated immediately. The Jedi ruins were once the site where Alliance agents had hidden a holocron containing the names and locations of hundred of agents, although it was later recovered by Dusque Mistflier. Tash Arranda and her brother, Zak, rediscovered the ancient Jedi ruins there, with the help of the Dantari Maga. Maga refused to enter the ruins, for the garoo of the Dantari told legends which said those who entered the ruins never came out. Tash discovered that the Empire was using the ruins - and the legends surrounding them - to create a new batch of clones, using a cloning laboratory which was established by the ancient Jedi Knights. Seven years after the Battle of Endor, colonists from the doomed world of Eol Sha were relocated to Dantooine to carve out a new life. Jedi Master Luke Skywalker suggested the world to the colonists as a new haven. Unfortunately, Imperial warlord Admiral Daala discovered the Dantooine colony, and unleashed an army of AT-AT walkers and ground troops to destroy it. During the Yuuzhan Vong crisis, Dantooine again was the site of violence. Yuuzhan Vong forces followed refugees from Dubrillion to Dantooine, and sent an army of slave soldiers to attack them. Like many other pastoral worlds, Dantooine was quickly captured and reformed for the use of the alien invaders.